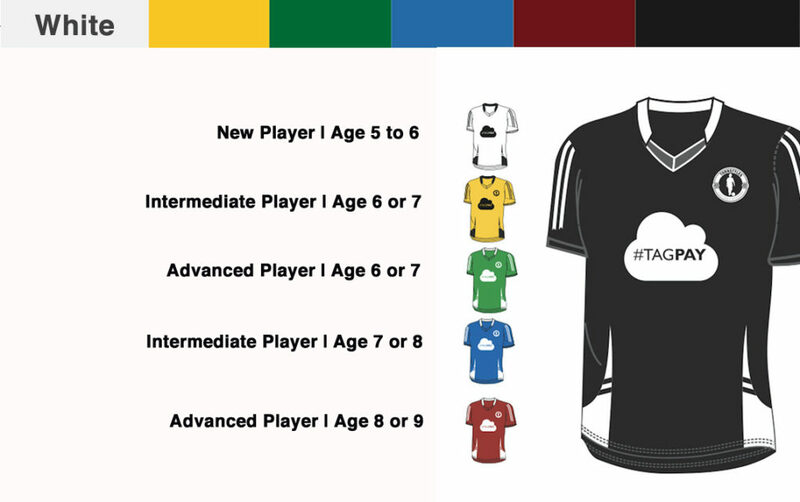 The goal of the Turnstyles Colour League is to allow young players to enjoy the game without the extra pressures of external football leagues. We want players to have more involvement in the game, more touches on the ball in a bright and colourful environment – with a purpose. The way this league works is truly unique in football (for children ages 5 – 9) as it uses the proven system of martial arts to help guide and grade the players through their own personal development at their own pac. Each player will play in a real kit to represent their current level, we have already anticipated that their will be occasions where a lower graded teams beats a higher graded team, this is super! Go the underdog. So, in short… Players will start off as a White Belt and will be graded every six weeks with a goal to achieve the Black Belt. The FA qualified Turnstyles Academy Coaches will guide your child all the way through until they reach their personal GOAL. 4v4 (4 players on each the pitch at once) matches with a special samba goal to allow for better accuracy when they graduate to the big league aged 9+. There will be one Coach / Referee per pitch ensuring the children receive constant and ongoing feedback / coaching. At the end of each game every player will receive a sticker for playing the 1 hour long match. The top player of the day will receive a medal that they will keep for the week and return to the manager on Sunday to allow another child the chance to win the MOTM award. The Turnstyles Colour League will start on Sunday 21st of October and will run through until Sunday 31st March 2019. We run during the school term time only and have a break for 3 weeks over the Christmas period. Please arrive at 8:45 prompt in your full colour league kit ready to start. Sunday 13th January 2019 – First New Year Games Return! The perfect place for your child to take a in team game sand training in London Enfield on the weekend. Join our classes and teams today.